History and Information on Constitution Hill at Birmingham in the County of Warwickshire. More information on Constitution Hill to follow. I probably created the page as I had a link to Constitution Hill from another page. When building the site it is easier to place links as they crop up rather than go back later on. I realise this is frustrating if you were specifically looking for information on Constitution Hill. There is information on Birmingham dotted around the website - click here for a suitable starting place. 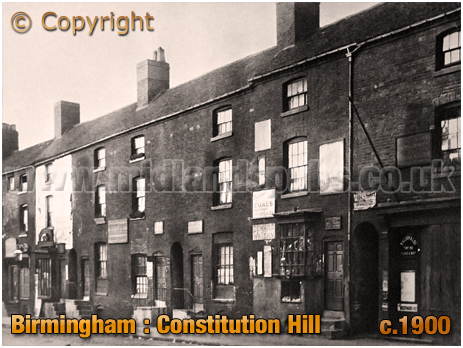 If you have a genealogy story or query regarding Constitution Hill you can contact me and I will post it here in addition to including your message within the website pages for Birmingham Genealogy. If you would like to share any further information on Constitution Hill - perhaps you drank in one of the pubs in the past? Or maybe knew a previous publican running one of the boozers? Whatever the reason it would be great to hear of your stories or gossip. Simply send a message and I'll post it here. "On Thursday afternoon an inquest was held at the Hen and Chickens Inn, Constitution Hill, on the body of a young married man, named John Buckley, who resided at 21, Constitution Hill, and who, on Wednesday last, committed suicide by hanging himself. The evidence went to show that the deceased, who was a farmer, and twenty-seven years of age, recently came to Birmingham, and took up his abode at the house of his brother-in-law, who carries on business at Nos. 21 and 22, Constitution Hill. For about two months past he had been in a wretchedly low and desponding state of mind, and although he was in pretty good circumstances, he was continually haunted with the idea that he would shortly come to poverty. He had, too, dreaded of going into a shop to purchase anything, for fear he would steal some article, and also suffered from a religious despondency. He went to bed on Tuesday evening in a rather strange state of mind, and during the whole night he was very restless, groaned at intervals, and talked incoherently and unintelligibly. His wife being unwell, on the following morning rose rather earlier - half-past eight o'clock - than he usually did to see about the breakfast. He had only been married about six months, and to show his great regard for his wife, said that if she died he would not live a minute afterwards. Owing to his wife's indisposition he became in a great state of excitement, and Mrs. Buckley, who was herself now called as witness, was of the opinion that he thought she would not live, and was, in consequence, driven to commit suicide. He left the house at about ten o'clock, stating that he was going to settle a bill, and he was not seen alive by his wife afterwards. Between 11 and 12, however, a girl, twelve years of age, named Mary Ann Towers, who is employed on the premises, saw him go upstairs into a workshop, and on going to him for some keys in about half-an-hour afterwards, she found him hanging by a rope, which was twisted around his neck, and fastened to a beam, which extended across the shop. She immediately raised an alarm, and the foreman, Mr. Higgett, went in and cut him down. He was always a very sober man. The Jury returned a verdict to the effect that the deceased had committed suicide whilst in a state of insanity." "Extraordinary Suicide in Constitution Hill"